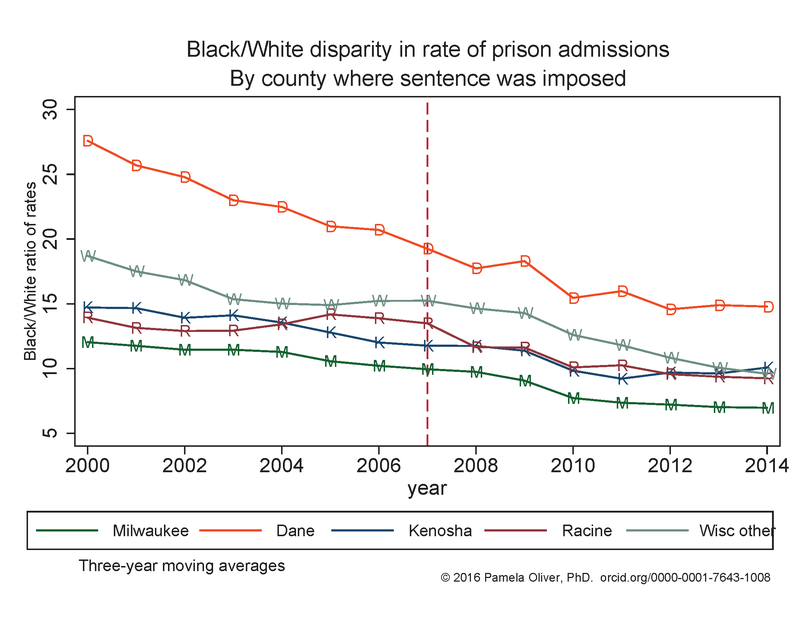 Dane County has the highest Black/White rate of prison admissions among Wisconsin counties with large Black populations, but it does NOT have the highest Black prison admission rate. That dubious honor goes to Kenosha County. Milwaukee County has high racial disparities in prison admissions and has over 70% of the state’s Black residents, but it does not have the highest racial disparities in the state (graph above) nor the highest Black incarceration rate (graph below). The graph above shows the Black/White ratio in the rate of all prison admissions, including both new sentences and revocations. The full report in PDF shows the patterns for admissions for new sentences only (no revocation), all admissions involving a new sentence, and revocations only. The graphs below show the Black and White rates of prison admissions by Wisconsin county. Although Dane is the most disparate county, the highest Black prison admission rates were actually in Kenosha county, which also has very high White prison admission rates. The graph below also shows that Black prison admission rates were generally declining after the mid-2000s. White prison admission rates have different patterns. 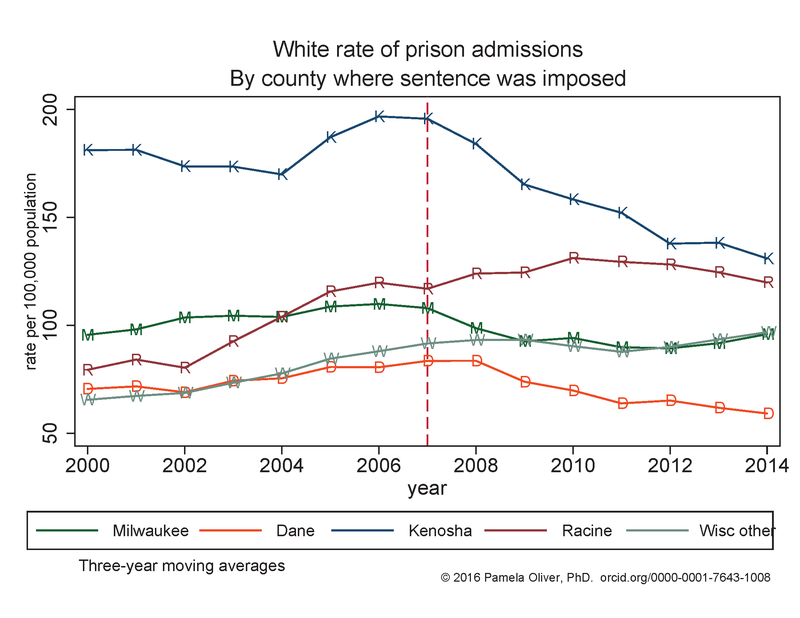 Racine and Kenosha generally have high rates of prison admissions for both Blacks and Whites. 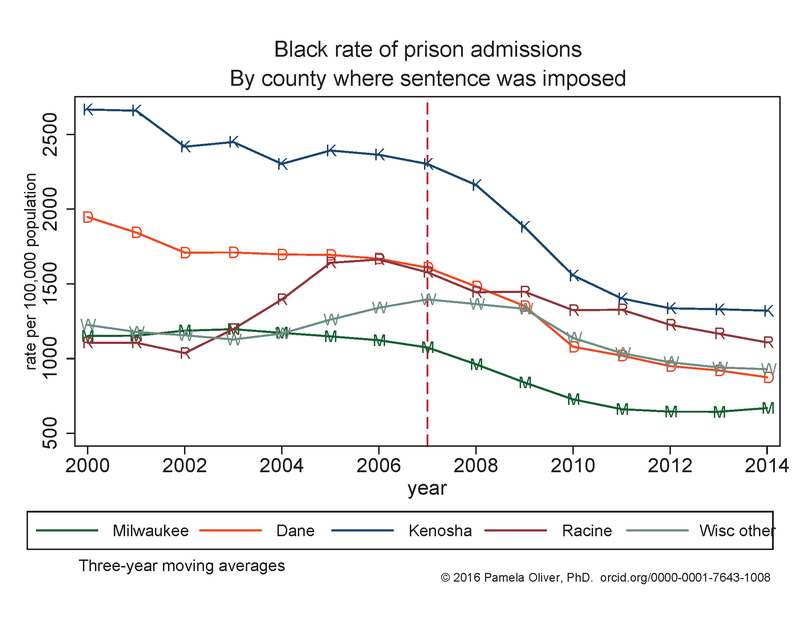 Dane’s Black prison admission rates were very high in the early 2000s, but have declined so that they are now lower than those in Kenosha and Racine, although still higher than in Milwaukee. Milwaukee’s White rates held relatively steady with modest declines after 2007. More details are in the full report in PDF , which also shows how these graphs vary somewhat depending on the type of prison admission. Comparisons for Hispanics, Asians and American Indians require more careful handling due to the small numbers of people involved. I live in wisconsin and it is sad to see that we are leading anything to do with people going to prison. It costs these people their lives and it cost taxpayers lots of money too.